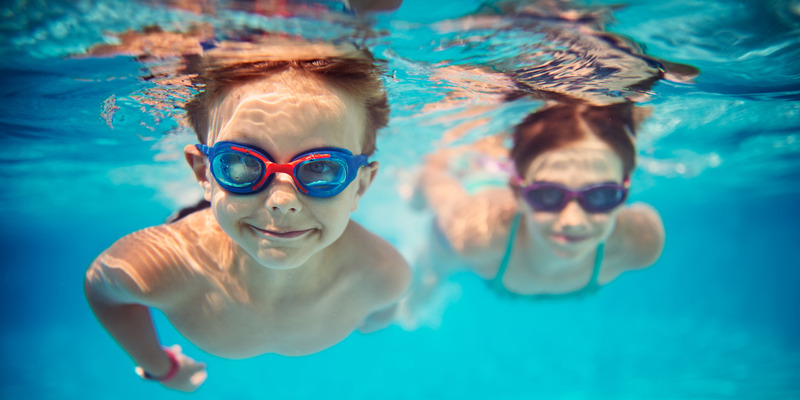 Swim goggles are an excellent addition to your summer beach bag or day at the pool with your kids, but they pose a few tricky problems for parents. 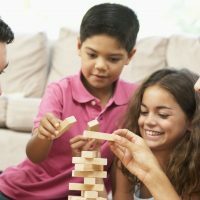 First, goggles are notorious for being flimsy and breaking – and also getting lost in the recesses of your closet or car, to the point where you’re convinced your kid’s swim goggles must be hanging out with all those orphan socks somewhere. The second problem is that they can be, well, painful. The rubber band that’s there to hold the goggles securely in place so your little swimmer doesn’t get water in his or her eyes (another big complaint!) can also pull and snag hair. Keeping these common complaints in mind, we set out on a mission to find goggles that keep kids happily exploring the underwater world (while also keeping the whining to a minimum). 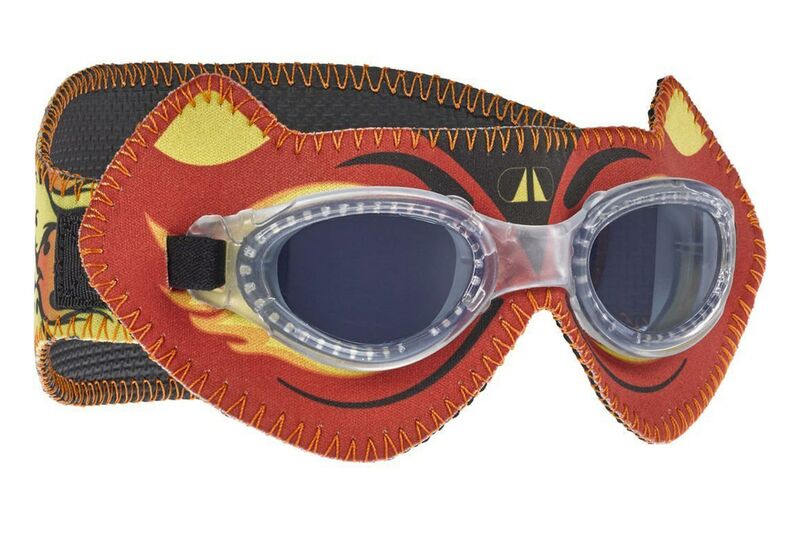 These are the best swim goggles for kids. When Christian Hahn watched his kids trying on regular swim goggles, he knew he could come up with a better solution. “There really is no way to express the level of frustration parents experience trying to adjust and fit painful swim goggles on their already nervous kids’ faces,” he wrote on his website. Enter: Frogglez, swim goggles with a neoprene strap that fits snuggly around a child’s head to ensure the goggles stay on tightly with no hair-pulling drama. 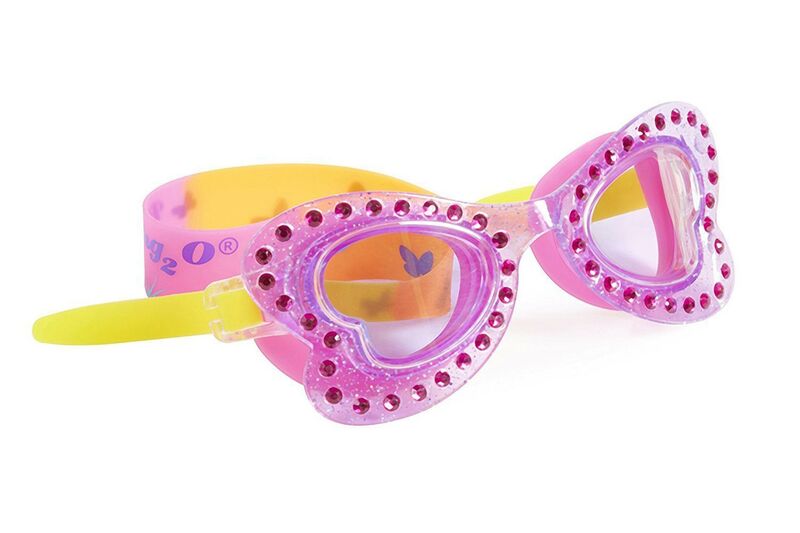 Parents with long-haired kids everywhere breathed a sigh of relief when these swim goggles came on the market. Another problem kids (and even adults) have with swim goggles is the lack of seal associated with cheaper models. Goggles that allow water in defeat the purpose of wearing swim goggles. The Aqua Sphere Goggles have made the seal a priority in the design of the goggles. They adjust at the sides, making it easier for parents to get a snug (and relatively pain-free) fit while their kids are wearing them. The lens spans 180 degrees, giving kids a great field of vision underwater (great for grabbing those underwater rings!). This product comes in a two-pack – great for multiple kids or for having a backup pair in case one is misplaced. We liked how the Qiandy Kids Swim Goggles included a built-in set of ear plugs. Ear plugs are nice (and occasionally a necessity for some kids), but they are virtually guaranteed to be lost at some point in the bottom of your beach bag. They offer great visibility and they seal out water very well. The goggles are adjustable so they can be used for several seasons. We had to include these goggles in the list mostly because of how adorable they are – who can resist these blinged-out butterfly goggles? Or these outrageous eyelashes?! They offer UV protection and a wide elastic strap. Some reviewers note variation in quality with regard to the rhinestones and other decorations, but the style is really something special – guaranteed to be the talk of the pool. Another solution to the hair-snag goggle problem: the Resurge Sports Anti Fog Racing Swim Goggles, which utilizes a bungee strap (a stretchy cord with an easy adjustment). 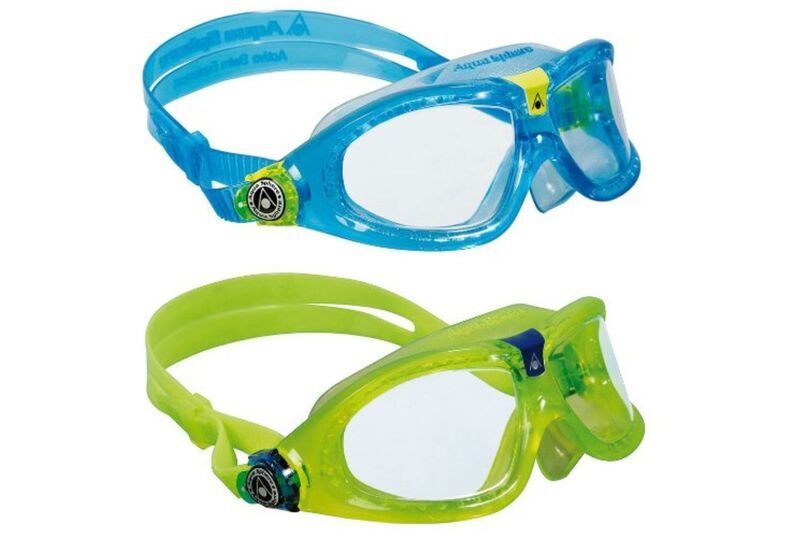 Though the product description says it is guaranteed to fit ages 10 and up, some customers were able to fit the goggles to children as young as 2 years old since the goggles come with three interchangeable nose pieces that can be custom-fitted to each swimmer. They come in a variety of colors of polycarbonate anti-fog lenses and a carrying case is also included. The Giovanni Swim Goggle Set is a great value, because in addition to swim goggles, it includes a swim cap, nose clip, ear plugs and a carrying case. Parents of kids with long hair might consider using a swim cap with their kids – not only will it protect their hair from chlorine, it also reduces any breakage or pulling from goggle straps. The snap closure at the back of the goggles also helps mitigate this problem, since you can do the adjusting prior to fitting the goggles onto your child’s head. Another great option for anti-fog goggles with UV protection and a strap that clasps at the back for minimal hair pulling, Hurdilen gets great reviews for the seal of these goggles and the easy adjustment of the strap. These goggles come with a nose clip, ear plugs and a carrying case. Note that some reviewers have said that the lenses may scratch. These swim Giggly Goggles are great for kids who are especially sensitive to the rubber or hard plastic pieces of more traditional goggles. Some kids dislike the way the nose piece feels on their nose bridge. The design includes a soft Neoprene fabric with textured rubber on the inside. The designs are cute animal characters like cats and tigers. 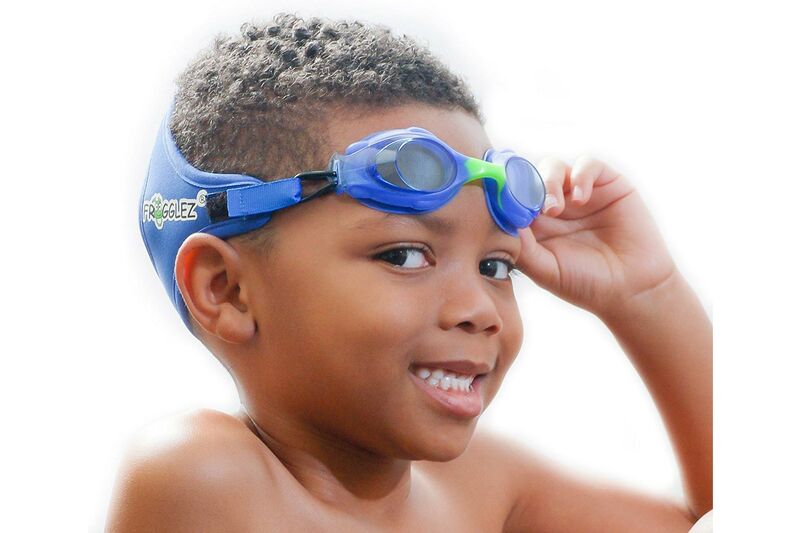 Parents love the fit of these goggles and the way they are designed for children’s comfort, but they are on the pricey side ($25 per pair) and they aren’t adjustable, so kids may grow out of them after a season.